I made it safely here in Buda and I am loving this beautiful city. There are thousands of people, many things to do and much to see. 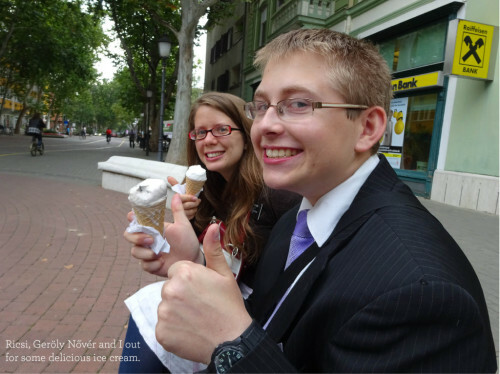 My newest companion, Jensen Nővér originates from Salt Lake City and she leaves home in January. 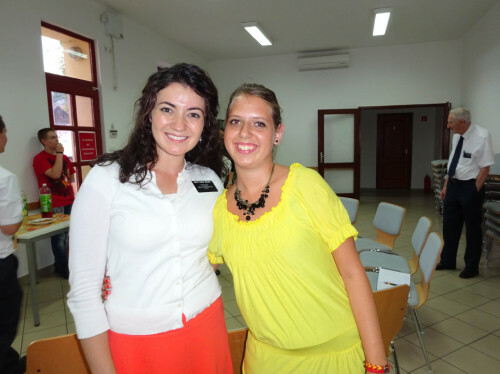 She is a powerful missionary, speaks exceptionally well Hungarian and someone I admire and look up to. Every morning we wake up and take a nice run around the park in the center of the city. It is starting to get incredibly cold and the leaves are starting to change colors. We have a wonderful apartment and each morning we are serenaded by an opera singer just above us. We had great lessons this week with new investigators and progressing as well. 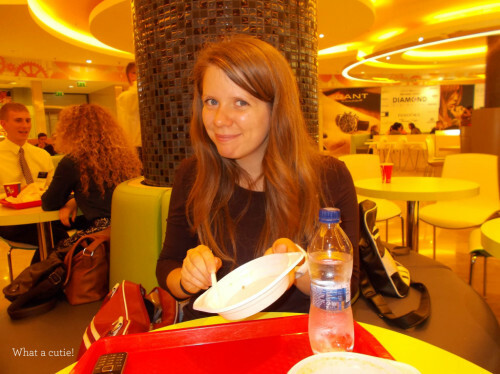 Just last week, my companion streeted a women named Anikő. We met with her this week and she is darling. She has the cutest laugh and sweetest countenance. 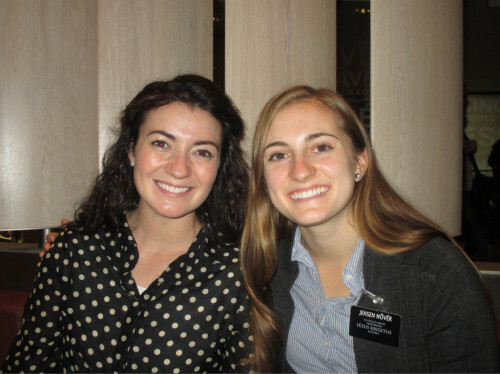 We taught her about the Book of Mormon and we gradually got into the restoration. As my companion said the first vision, the was such a peace in the room that I have never felt before. It was quiet and calm and every word that came out of her mouth was powerful. 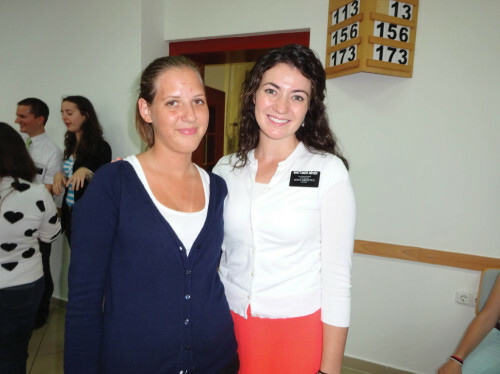 We set up to meet with Anikő again and she said she would read the Book of Mormon. Church in Buda is absolutely amazing. There are hundereds of strong, active members and many families. It just shows that the church is growing everyday. This gospel is absolutely incredible and what a blessing it is to be apart of the work. There are days when it is hard and you feel like you cant go any longer, but God will always be there, and he wants you to be successful. He sees how much you can handle and then he will step in to do the rest. Trust in him and all will be well. I want to thank you for all the love and support you have shown me. It means the world to me. 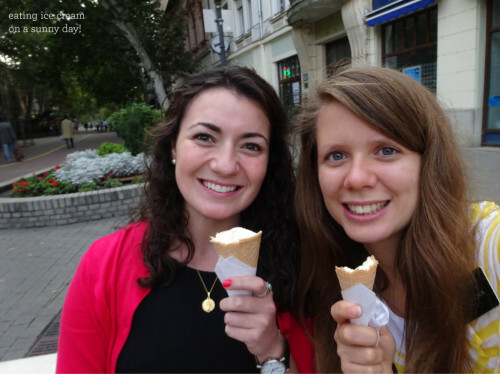 Hungary is still hungry for the gospel! I love you all and I hope you all have a fantastic week! Now before I tell you the bittersweet news, let me tell you about my week first! 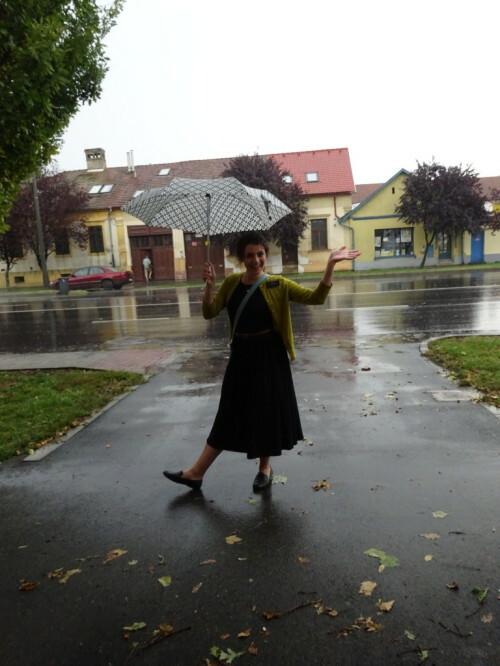 We’ve had a few rainstorms here in Békéscsaba and it’s cold enough for coat weather. We kept ourselves very busy and came up with some creative ideas to find people. Yesterday we compiled together pictures of Jesus Christ, the temple and family. We walked around and asked people their thoughts or feelings towards the pictures and we were very successful! 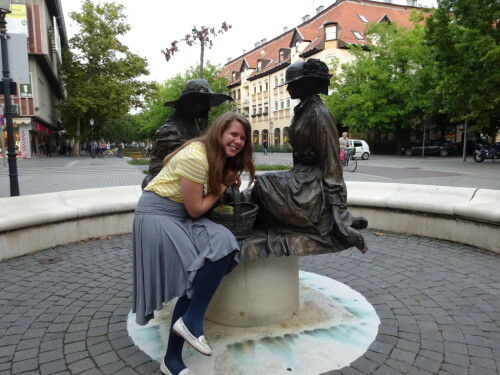 Our wonderful investigator, Rozsa is rock solid and has developed a love for the Book of Mormon. We have a new investigator by the name of Davíd who is such a champion! He is fourteen years old but looks like he could be twenty. 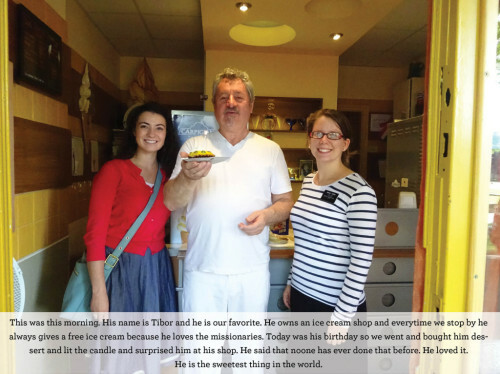 He is very religious and attends the Catholic Church every Sunday, which is very rare for someone as young as he is. This week we invited him to our church and he came on Sunday and LOVED it! A few of our investigators really struggle to commit to pray to God. I came across something so beautiful during my personal studies. It is Gods generous invitation to ask and it shall be given unto us. This timeless offer to provide personal revelation is extended to all of His children. It sounds too good to be true, but it is VERY true and all we have to do is ask with a sincere heart, with real intent, having faith in Jesus Christ. It is simple as that! I know that God lives and hears all our prayers He loves us and all we have to do is humble ourselves, get on our knees, take that leap of faith and pray. 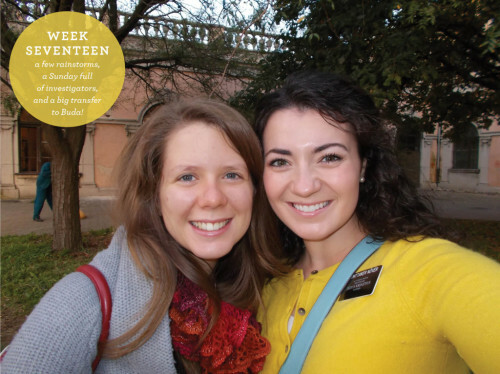 As a missionary, you feel very incapable of doing the Lords work. But what I have learned is that God doesn’t call the qualified, but qualifies the called. This week is transfers week and I am leaving tomorrow to serve in Buda! 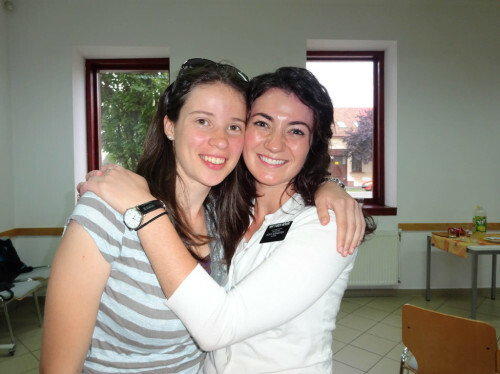 I can’t tell you how excited I am to serve in the heart of Hungary but it will be extremely hard to leave Békéscsaba, the people, the ward and my incredible trainer, Geröly Nővér. I know that God knows best and He sees the whole picture. Always trust in Him. I hope you all have a wonderful week and God bless! You’re all in my prayers. It’s been quite the week here in Hungary. The sun decided to hide itself and give us rain. All week it’s been raining but that didn’t stop us from the work! 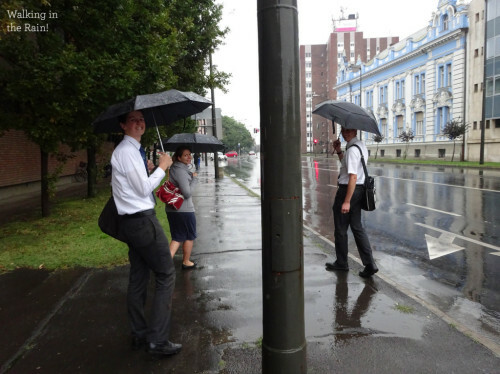 Hungarians do not like the rain or cold so streeting gets a lot harder when no one is out. One day during a rainstorm, we took our umbrellas and headed out. We stopped a man to talk and he started to go off in Hungarian. He said, “Are you crazy? You’re trying to talk to me in this weather?” Nonetheless, he had an umbrella. Everyday seems to get colder and colder. Fall is moving in and sadly the ice cream shops are closing down. We had a great lesson this week, and we are currently teaching three Péters. We had to move back Rozsa’s baptism date but she is still strong and faithful! Maria has been an investigator of ours for about a month now and she is incredible. 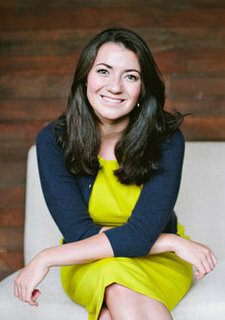 She LOVES the Book of Mormon and her husband loves it too. Her husband is a huge musician and he looked up the Mormon Tabernacle Choir, and turns out he loved it so much he posted it on Facebook! 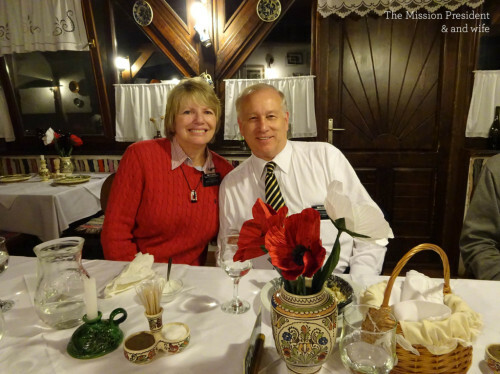 On Saturday the Mission President and his wife came down to Békéscsaba and they took us out for dinner at the sweetest European restaurant that looked like it came out of a children’s fairytale book. In Hungary, they have something called “fruit soup”. They have strawberry, blueberry, cherry and all other kinds of fruit. They make it into a soup and serve it cold. SO delicious! On Sunday we had the privilege to hear from the mission president, his wife and ME! 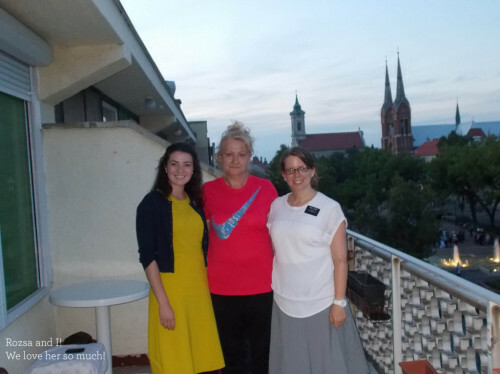 It was my first time speaking in sacrament and having to speak in Hungarian was quite the challenge but I stayed on my feet and hopefully they understood a few words. 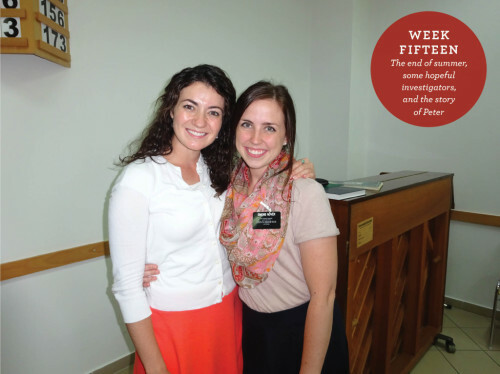 I spoke on seminary and the experience I had when I gained a testimony of the Book of Mormon. I love this gospel. The happiness it brings me is indescribable. I know that God lives and His son, Jesus Christ. I know that the Book of Mormon is true and through that we can find all our answers to life’s problems. We are never alone in the storms of life! 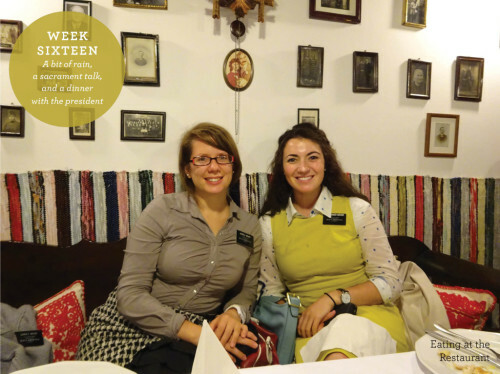 I love Hungary and I feel very blessed to serve in such a beautiful city. The mission not only changes people’s lives but it changes yours as well. Have a wonderful week, be safe and enjoy every minute you have. Life it too short! 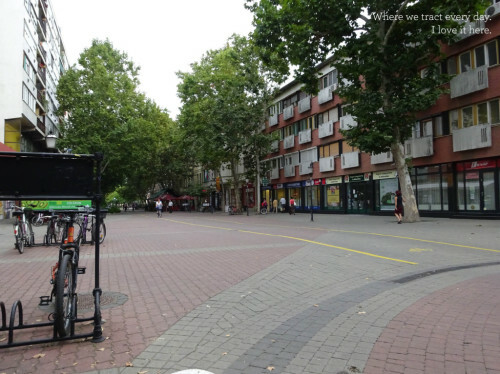 Time just seems to be getting faster every single day here in Békéscsaba. 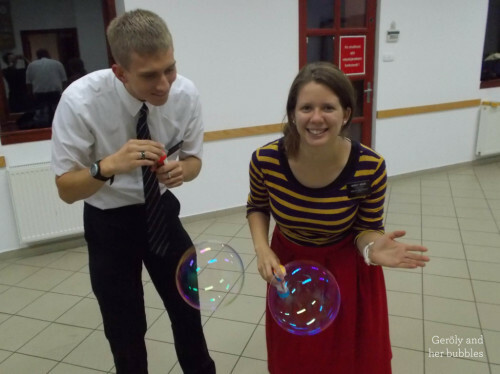 The work is still going strong and there is never a dull moment out on the mission field. You meet all kinds of people with different faiths, cultures and trials of their own and you have that incredible opportunity to share with them the gospel of Jesus Christ. It is truly a miracle. Békéscsaba had had quite the weather change this week with many storm clouds and the air changing to cool. We made sure to get as much ice cream as possible before the little ice cream shops close down for the fall. School has started and during our morning runs, everyone is up bright and early for their work day ahead. No one seems to sleep-in around here! We have three new progressing investigators who could potentially be our next three new priesthood holders. Danny, our new progressing investigator is in his forties and works in a meat shop just down the block from the church house. Our lessons usually take place in the back of his meat store where you get a nice scent of every meat you can imagine. Something you should know about the Hungarian people is everyone seems to have the same names. Here are the top names: Janós, Tibor, Péter, Edit, Levi and the list goes on. They have something called “name day” which is celebrated like your birthday. Every Hungarian’s name has a specific date, and on that day they receive gifts and have a parties. Unfortunately “Megan” isn’t found on the list. The food here is quite delicious. Cheeses, meats, and incredible chocolate bars…they have it all! 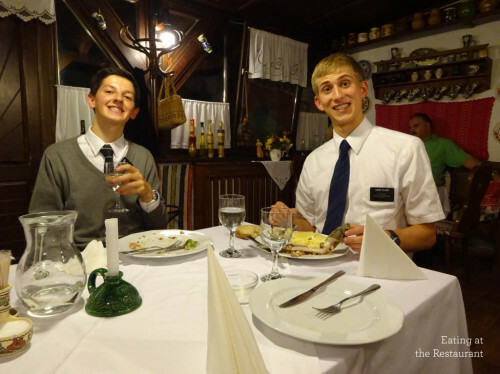 Dinner with a Hungarian is quite the experience. They have up to 6 courses and they insist on you taking two plates for each course. And you’re not finished until they bring out the dessert. 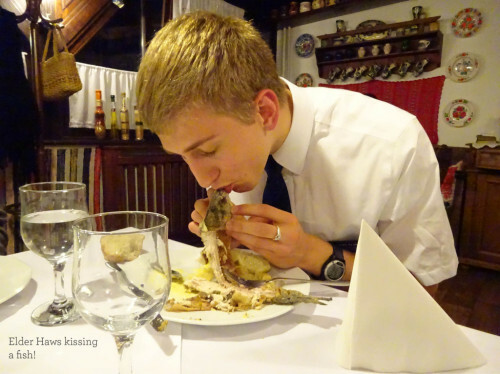 You can anticipate gaining up to 10 pounds at just one dinner event! This week was full of programs and tracting. We had much success and met most of our goals. 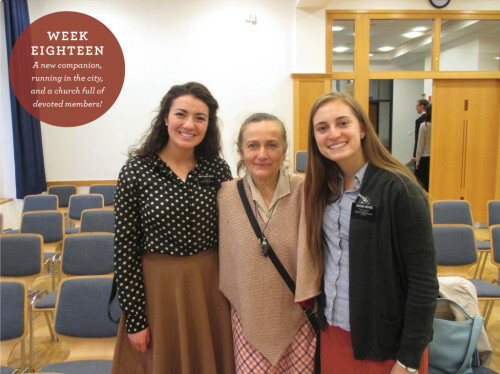 Rozsa, our sweet and incredible investigator is progressing everyday and has gained a testimony of the Book of Mormon. We cannot wait for that special day on September 20th when Rozsa gets baptized. What a beautiful day that will be. This week during my personal studies, I studied about Peter and how he walked on water. The Lord asked him to “come” and Peter took that leap of faith and trusted in the Lord. That beautiful story relates to us today. We have feelings of doubt or fear. We feel inexperienced and not good enough, almost to the point where we think we will fail. Life has many storms, and there will be days when you feel like you are sinking, (as Peter felt) just remember what happened to Peter: “immediately Jesus stretched forth His hand and caught him.” He will always be there to make sure you never sink in the storms of life. Do you remember the story of the five loaves? How he blessed them and broke them and fed thousands? If the Lord can do great things with a single loaf, imagine what He can do with a single life. Give Him all you have to offer. He will bless it, and He will make it more. Time to get back to work! I love you all and I hope you have a great week! Be safe and always remember you’re in my prayers.